Brazil's government unveiled new financing and other incentives for sugar cane ethanol production, vowing to work closely with the private sector to boost production in an industry that has struggled recently despite its immense promise. World beef prices look set to stay high long term given the rocketing prices of raising cattle in Brazil, and the lack of an obvious successor as the world's low-cost producer. The European Union and Mercosur admit they have internal problems that are delaying discussions, and results, for a broad association and cooperation accord that contemplates a trade agreement questioned by strong interests from both sides. Mercosur members Brazil and Paraguay harvested unprecedented soy crops this year while Argentina’s results are disappointing limiting its exports, according to the latest report form Hamburg based Oil World. Uruguay harvested a record crop of rice this year totalling 1.65 million tons and marked the second highest area planted with the cereal, 195.000 hectares compared to the 200.000 of eleven years ago. US agricultural processor Archer Daniels Midland Co said this week it was building a grain export terminal in Nueva Palmira, Uruguay, capable of loading large bulk shipments of corn, wheat, soybeans and soy-meal. 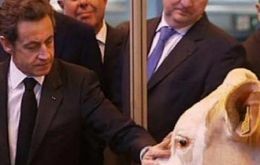 French president Nicholas Sarkozy stressed over the weekend he would not accept an European Union-Mercosur trade agreement that could mean a loss of income for European farmers. Uruguay which does not harvest transgenic rice has been consolidating as a growing European Union supplier and is a traditional provider for Mexico and Middle East countries such as Iran and Iraq. The Chilean Federation of Fruit Producers (Fedefruta) will join with the Association of Exporters (Asoex) and nearly 50 other exportation and agricultural associations across Chile to present proposals to, and demand aid from, the government next Friday, May 20. They will convene in Requínoa, in Chile’s Bernardo O’Higgins Region.